– The Award is conferred to Tania Ellis for her significant contributions towards social change and purpose of guiding and inspiring individuals and organizations to engage in innovative and sustainable practices that generate both social and economic value, explains Dr. R L Bhatia, who has initiated the award to recognize women worldwide who work for and believe in “the MAD approach” – Making A Difference. The Award ceremony was part of a two-day congress with the theme “Sustainable Leadership for the Future”, where Women Leaders from around the world will be identified and celebrated for their outstanding leadership and achievements, reflected by their distinct innovations and initiatives brought in by them in various private, public sectors & entrepreneurship. The official Women Leadership Achievement Award ceremony took place 14 February at the prominent Taj Lands End. While Tania Ellis was in Mumbai, she also contributed with a presentation at the World CSR Day conference in the following week. – India has made a bold move with its recent Companies Act 2013, which, among other things, requires that at least one board member is a woman, and that companies must spend at least 2 per cent of their net profits on “CSR” activities. To me, this confirms once again that the concepts of sustainable leadership and corporate responsibility are not just Western phenomena, but rather an expression of a global responsibility movement – and we have only just seen the beginning, says Tania Ellis. Over the past decade, Tania Ellis has been known as one of Scandinavia’s leading social business specialists, and her expertise and hands-on involvement in blending economic and social value with business strategy and innovation has made her a popular and inspiring public speaker and strategic advisor for both social start-up companies as well as multinational corporations and a range of Scandinavia’s most respected companies and organizations. 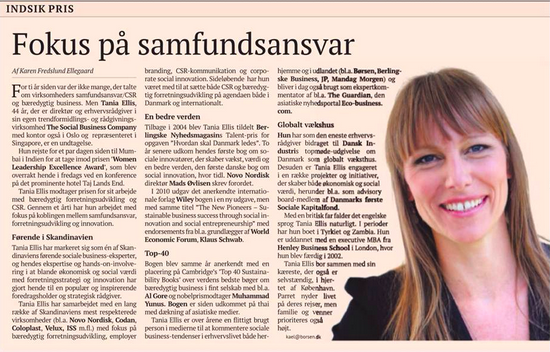 Tania Ellis is also a prize-winning author of the first Danish book on social innovation “De Nye Pionerer – om sociale innovatører der skaber vækst, værdi og en bedre verden” with foreword by former Novo Nordisk CEO, Mads Øvlisen. In 2010, international publishing house Wiley published the book in a new edition but with the same title “The New Pioneers – Sustainable business success through social innovation and social entrepreneurship” with endorsements from, among others, the founder of World Economic Forum, Klaus Schwab. That same year, the book was ranked on Cambridge’s ‘Top 40 Sustainability Books’ in fine company with, among others, Al Gore and nobel prize winner Muhammad Yunus. The book has now also been published in Thai. 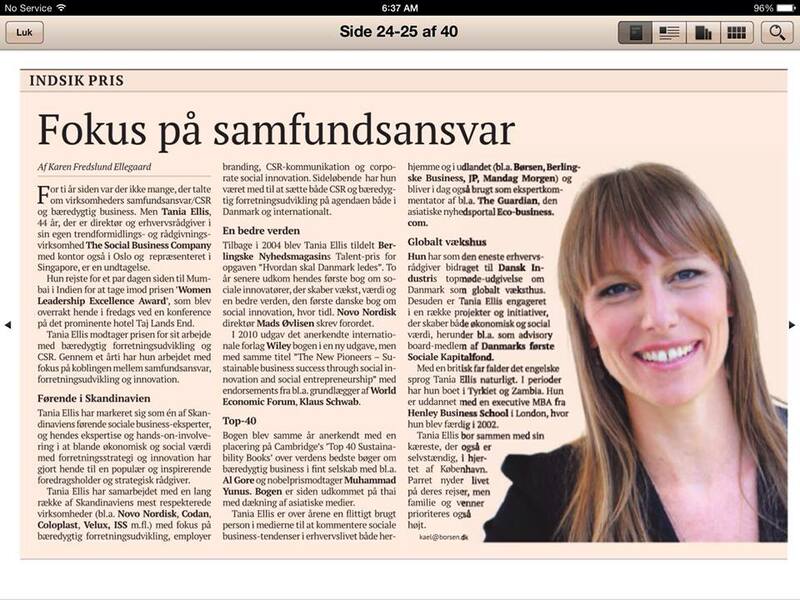 Tania Ellis has also authored dozens of articles on social business trends and strategies, and is a popular expert commentator with regular features and contributions in national and international media like Berlingske, Mandag Morgen, The Guardian and Eco-business.com. Tania Ellis holds an Executive MBA from Henley Business School in London, and has 22 years of management experience, first in the airline and advertising industry, and now on the 10th year as Managing Director of her own trend communication and consulting company, The Social Business Company, which today has office in Denmark, Norway and representation in Singapore.